Games of solitaire are becoming increasingly more popular, especially since there are so many variants and you can play them all for free! Freecell is the most popular solitaire game and is available whenever you want it, right at your fingertips. Like all solitaire games, Freecell is a card game played with one single deck of cards. Traditionally, it is a single-player game but it is not unheard of for it to be made into a multiplayer game on some online platforms. You can even play Freecell competitively in real life! In Freecell, there are three different types of piles that you would be expected to use. The first type is the free cell pile – four piles in the upper left hand corner; the foundations – the next four piles; and the tableau which is eight piles are the most important ones and make up the main table. In order to win the Freecell game, the objective is to move all of the cards onto the foundation piles, but they must be ordered by suit and rank. Each foundation pile has a suit, and after this you must put all of the cards in order right from Ace to the King. The order of the cards should go Ace 2 3 4 5 6 7 8 9 10 Jack Queen King. Differing from most other types of solitaire, Freecell is almost impossible to lose and all you need is a bit of patience and strategy – there’s no reason you should give up. The most obvious moves are not always the best moves. You should assess the tableau very closely before making any moves. Another good tip is that you should try to keep as many cells free as you possibly can, this makes it easier for you to shuffle your cards around to find the best place for them. You should only ever place cards in free cells if there is no other alternative, otherwise you could block up all of your spaces and you won’t be able to move around. Something to keep in mind is that you should create an empty column as quickly as you can. They are more important than free cells because the columns can be used to store more than one card, even sequences of cards if that’s what you need to do. This can make the game a lot easier and will help you keep ahead of the game. Okay, Freecell sounds cool, but where do I go to play it? Well, it’s simple. You can buy a pack of cards and play Freecell in your own time, or you can play it for free online. 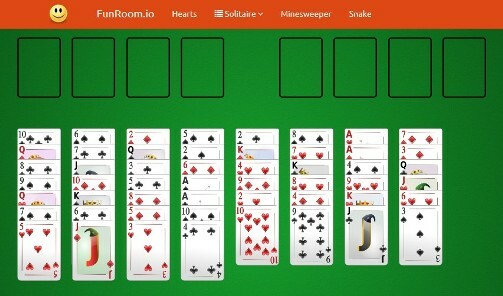 FunRoom is a brilliant place to play Freecell, as well as many other different types of solitaire based games. On some online platforms, you will be able to time yourself so that you can try to beat your lowest time next time you play.